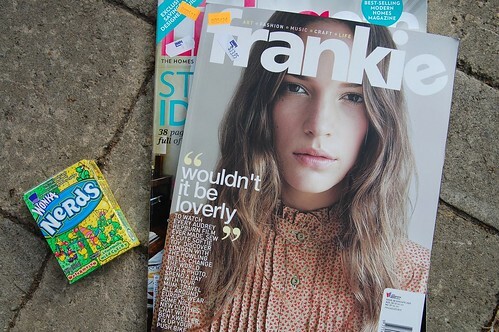 I had been searching hi and lo for a copy of the elusive Australian Frankie magazine for a while and FINALLY found a copy a couple weeks ago. I was excited, but little did I know just how perfect this magazine is for me. 1. Even just a small blurb about Audrey Kawasaki gets me excited. 2. 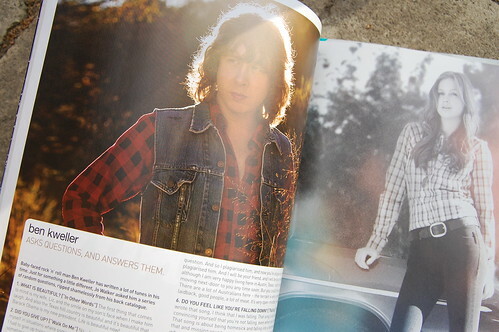 Seeing a fun article and photo of my friend, Ben Kweller, who is a seriously crazy talented musician and all-around amazing guy. 3. 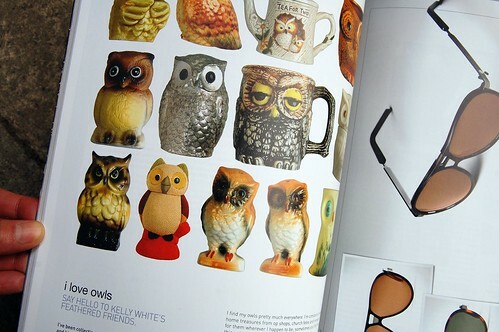 I LOVE owls too! 4. Flowy, gathery smock tops. 5. 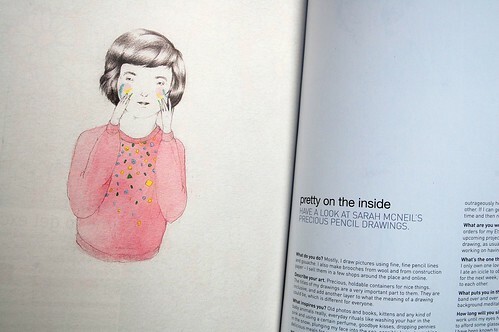 There is a Sarah McNeil (maker of two bunny works that I now own) article and pull-out poster. This is not to mention the perfect cover with sweet pintuck blouse, the article on Audrey Hepburn’s movies (Must see – Paris When It Sizzles), or the recipe for Chorizo Potato Salad (I really like potato salad). I’m excited for issue #29. And the long weekend. the workroom will be closed on Sunday for the holiday, so I will have two days off in a row. All day gardening is on the agenda! I didn’t knew it, but what you says and show makes me want to have it! I wonder where I coudl find it…. 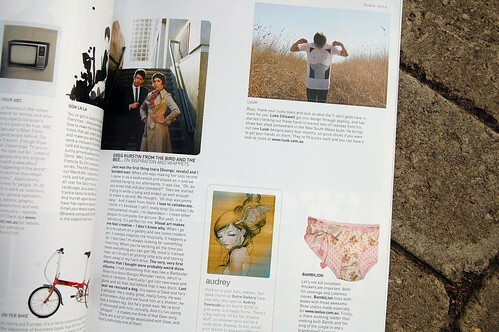 i spotted frankie at aritzia many months ago but i had never picked it up to look through it. 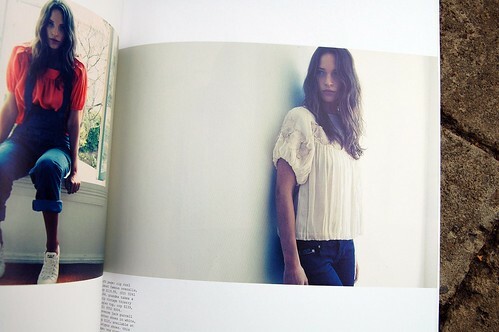 they also have a cookbook called ‘afternoon tea’ that looks pretty sweet. Oh, I love Audrey Kawasaki, Ben Kweller, owls and Sarah McNeil! Paris When it Sizzles is worth seeing for the interior of the hotel room it’s (mostly) set in alone! you’re friends with ben kweller? whoa! i like his music a lot! a] i will bring you Paris When it Sizzles on the next “look at my haircut” visit. and b] NERDS! oh! one of the sectaries at my workplace has Nerds Jellybeans and oh my goodness, were they a treat!